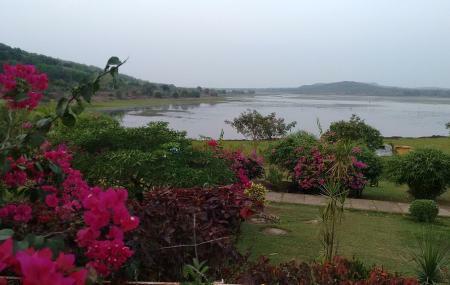 Spreading over 141- hectare area, Ansupa Lake is the largest fresh water lake in Orissa. It is in a horseshoe shape with Bishnupu hills on its north eastern side and Saranda hills on its western side. Come in winter and you will see that the lake becomes the shelter for many migratory birds. If you are fond of bird watching, then make sure you visit this lake in this season. Take a walk around the lake and you will come across many new species of plant in the nearby forest. Best time to visit the lake is during winter season. Minimal fee is required to hire boat for boating. Check the official website for the detailed information. You can visit the lake anytime of the day. However, early evening hours are preferred. How popular is Ansupa Lake? People normally club together Pipili and Jagannath Temple while planning their visit to Ansupa Lake. If you love nature, you will surely love this place. Don't forget to visit the mountain top. It's actually a destroyed fort. The view from the top watch tower is really appreciable, it also provide bamboo cottage for night stay. The ticket price for the park is Rs 15/- and the mountain fort is Rs 10/-. The park also gives a option of boating at the cost of Rs 25/- per person,must give it a try and taste the lake water because it's really very sweet. Efforts has been made to enhance its natural scenic beauty. Boating is the best part here. Anshupa lake is surrounded by nature and forest. There is a hill beside the lake which makes it look like a valley. It's so beautiful here , it feels great to be here. Boating facility is also available here. The condition of the lake is not so good but it's under renovation work. The park consists of many flowers which is also very beautiful. Apart from that there is nothing to see here . Good park. There is provision for boating. Toilets are provided. Water supply is not assured. How ever ok.